rec. ABC Studios, Adelaide, October 1982 (Requiem) and March 1983. This is a very welcome “two for the price of one” double CD set from Lyrita. It brings together two excellent Unicorn-Kanchana LPs (DKP9026 and DKP9032) featuring the music of Wilfred Josephs. The Fifth Symphony is structurally highly satisfying. The first movement takes the listener to a dark and desolate landscape. A mood of tranquillity pervades the music but the mood is disturbed and interrupted by two loud intrusions. This sombre opening movement is a different kettle of fish to those penned by Beethoven and Vaughan Williams in their Pastorals. In complete contrast the Vivace leggero is light and skittish with a quirky dotted-note theme. There are hints of Sumer is icumen in played by the celesta and this tune emerges fully formed later on in the movement. This quicksilver scherzo is imaginatively orchestrated and maybe offers an alternative twist to Beethoven’s Peasants' Merrymaking. The symphony was written in 1970, the same year as Tippett’s Shires Suite. This suite also incorporates Sumer is icumen in. Pure coincidence perhaps? The Adagio is a perfect foil to the Vivace leggero. This serene movement is dominated by a string melody that gently unfolds in the cellos and violins. We are now in a typically English pastoral scene. This is moving nature music and it represents the heart of the symphony. The Intermezzo Notturno depicts night time in the countryside with its myriad scurrying insects and small animals. This eerie music — more nightmare than night-time — wouldn’t be out of place in a horror movie but the mood then changes with a bell-like daybreak scene at the beginning of the joyous Epilogue. The atmosphere then quietens and the symphony concludes with the hushed, disconcerting material first heard at the very opening. The Variations on a Theme of Beethoven was given its premiere by André Previn and the LSO in the Carnegie Hall in 1970, the year of the bicentenary of Beethoven’s birth. The theme chosen by Josephs is taken from Beethoven’s Piano Sonata Op.49 No.2; it also appears in the Septet Op.20. Josephs’ work is good-humoured and sets off with the theme announced by a marimba accompanied by a chamber orchestra. The nine variations are colourful, entertaining and inventive. The highlights include a sombre Adagio, an expressive Mahlerian Passacaglia and a bitter-sweet waltz. The Finale opens powerfully but then returns to the simple marimba theme heard at the very beginning. The work concludes with a glorious raspberry. 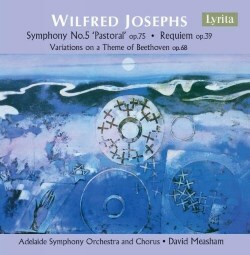 Joseph's Requiem from 1963 is composed in a 12-note style. It is based on the Jewish prayer of mourning, the Kaddish, and was written in memory of the Jews who died in the Holocaust. The requiem consists of ten movements divided into four sections. It is a serious and deeply disturbing work. The opening Requiescant for string quintet sets the scene. This is a thoughtful elegy and leads into the introspective Yitgadel with its florid soprano solo. The second section, Yehey Sh’mey Raba is the only extrovert, uplifting and consistently loud movement in the entire work. The third section consists of two bass baritone solos - beautifully sung by Robert Dawe - that frame a central Lacrimosa for string quintet. The final section opens with De Profundis, an extended piece for orchestra in the style of a solemn processional. The requiem comes to an end with the austere Ohseh Shalom and after a dramatic stroke on the tam-tam the music recedes into stillness and then silence. This is a major work and would be enjoyed by those who warm to Tippett’s A Child of Our Time. Performances throughout are accomplished and vivid. The early 1980s digital sound is clear and has plenty of impact but it is rather dry and compressed at climaxes. The extended supporting liner-notes in English only are by Paul Conway. There is some thought-provoking and well-crafted music here which will appeal to anyone with an enquiring nature. Great value too.